It has been four years since 2007’s harmlessly infectious Bring on the Comets, the last full-length offering from dancefloor rockers, VHS or Beta. Despite the occasional single, the band has maintained a low public profile. This tendency to remain out of the spotlight has neither fostered nor lowered expectations regarding future projects. But at the rate at which the electronic genre has developed while subsequently expanding its potential, the innocuous beats of VHS or Beta seem frankly a little forgettable. Admittedly, there is a time and a place for all sounds, but perhaps 2007-2011 was the wrong moment for such a lengthy breather. With the advent of chillwave, dubstep, etc- the genre suddenly went from standing room only to immense fire hazard. Cut Copy certainly didn’t do VHS or Beta any favors during their four-year sabbatical. In retrospect, while far from outright theft, Cut Copy had no qualms with doubling down on this image with back-to-back albums of immense popularity. By the release of the ambitious and critically lauded Zonoscope, they had fully usurped the mantle and VHS or Beta was a distant memory. Regardless, with the relocation of band masterminds, Craig Pfunder and Mark Palgy, from Kentucky to New York acting as a possible catalyst, we have the imminent release of Diamonds and Death. So oblivious to itself, it is almost endearing- here is a comeback album unaware of the statements it needs to make. Perhaps I’m being too hard on Diamonds and Death. This is far from a turgid affair and it definitely moves. But it fails to come alive; even though some songs (“Breaking Bones”, the Depeche Mode-esque“I Found a Reason”) seem to hint in new directions, VHS or Beta insists on regressing into familiarity. As a result, the album feels frustratingly anonymous. Any kind of signature, personalized spirit from Bring on the Comets feels largely subdued here in favor of more traditional, 80s-tinged club anthems. And this is a shame because it’s easy to imagine VHS or Beta fans looking at their previous album as a building block for something more ambitious. Instead, Diamonds and Death comes off as rote. An album doesn’t always need to feel outwardly challenging, but it should at least seem to have it’s own relative aspirations. At it’s best (“Under the Sun”, “Jellybean”-driven by an INXs-type guitar riff), it feels as if we are part of something better. 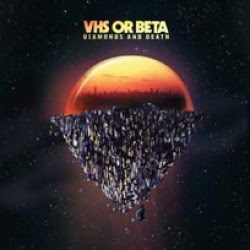 At it’s worst (the pedantic title track), Diamonds and Death seems stuck in neutral- and ultimately, a little boring. I loved Night on Fire...saw them live twice! Yeah I've seen them a bunch too and they really rock! I don't think this album is boring at all, I think it's awesome and everyone should buy it to support them! !